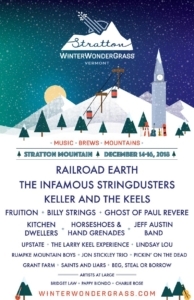 The inaugural WinterWonderGrass Vermont, held at the Stratton Mountain Resort! WinterWonderGrass is mostly an outdoor event with numerous heated tents housing side stages, the kids' zone, coffee, ar and beer tastings. We are part music festival, part beer festival, and 100% mountain adventure. Bump into the artists of WWG on the hill, then join us each day at 1:45 for 3 hours of daily beer tastings (2-5 pm), and music on four stages. The event ends at 10 pm, if you want to keep jamming, you can buy a ticket to the after parties around Stratton Village. Join us for three days of music featuring headlining sets by Railroad Earth, the Infamous Stringdusters, Keller Williams, Fruition, Ghost of Paul Revere, Upstate and 15+ more bands.